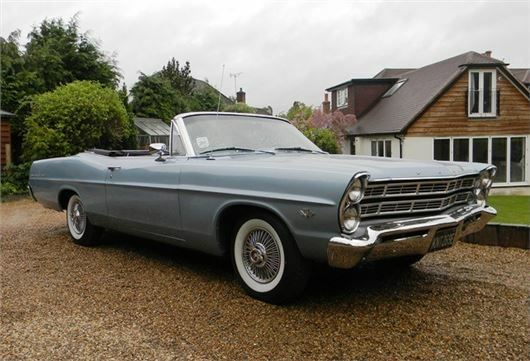 I am thinking of shipping over a ‘classic‘ 1960s Ford from the USA. They are beginning to fetch silly money for the right model. Do you know any people / forums I can bounce queries to? The post-Brexit dollar rate makes this much less attractive and there have even been rumours of sterling and the dollar reaching parity, which will make any American car 50% more expensive than it was before the vote. There's quite a lot in here: /useful-websites/buying-importing-selling/ But you should also be checking results at Mecum auctions and Barratt-Jackson because the choice cars are already fetching huge money in the US, often (but not always) a lot more than they fetch here even after import taxes (some of which are avoidable). Barratt Jackson and Mecum are for anything from 1900 to 2016, but the heaviest emphasis is on 1960s and 1970s American 'baby boomer' cars. You'll also pick up a lot of information from watching American TV shows like Fast 'n Loud, Wheeler Dealers, Countin' Cars, etc., because they will show you what the cars are costing the dealers and restorers pre-restoration. For example, you won't find a 1950s or 1960s Cadillac convertible in restorable condition for less than $10,000 while an original steel body for a ’32 Ford could set you back $10,000 plus. In the past you have given me excellent car advice. My wife and recently invested in a new Autotrail Imala 620 motorhome and we are thoroughly pleased with it. We are now considering buying a small car to tow behind it. What small car do you recommend? What aspects of 'car towing' do we need to be careful of? We are thinking of selling our much-loved VW Beetle as we really do not need two cars but have little idea of its value. We bought it new in March 2000, it is yellow, automatic, with sunroof and air con. It has a full service history with all records, etc. 37,000 genuine miles and is in excellent order having always been kept in a garage. Your advice would be much appreciated. A friend of mine has a 10-year old Nissan Navara pick-up. The documentation that came with the vehicle clearly shows that there is a 12-year warranty on the chassis. However, it is rusted and rotted to the extent that the truck is too dangerous to drive. It was bought from a reputable main dealer, but he is no longer a Nissan agent. So far, Nissan as a company seems disinterested in accepting liability. What do you suggest my friend should do? A condition of these warranties is usually an annual inspection at a Nissan dealer. Check the documentation. If this term is there and has not been complied with then the warranty is void. You were very kind when I asked you about a Volvo problem but here is an even more ridiculous one. Three months ago I lost the main key for my Volvo V40 Estate and since then I and various others have been trying to find a replacement. Volvo in Taunton very kindly gave me the part and code number but were unable to supply a key themselves. They advised we ask Volvo Spain which we have done on numerous occasions and today, when my poor hard working mechanic rang them yet again, they even lost the chassis number. I have been a long time owner of Volvos and am absolutely furious and amazed that they cannot supply me with this simple part. Have you any suggestions as to where we can turn now? Being a central locking car seems to be part of the problem. If you can help me to resolve this mess I would be so very grateful. If this is a modern Volvo V40 then (by EC Directive) the coding has to be accessible from the ECU via the OBDII port, so a Volvo dealer can obtain it and code a new key. Not cheaply, but can be done. But if this is an old 1996-2004 V40 I don't have an easy answer. If there's nothing to copy the key from, then it probably means getting door lock and ignition barrels from a wreck, together with the appropriate key and somehow isolating any immobiliser function. I have two questions unrelated, I hope you don’t mind: Our car, a Peugeot 3008 registered in September 2012 has a warning lamp on about the airbag, which our garage can’t repair. They said that it needs to go back to a Peugeot garage to correct but they said we should check if it would still be under the manufacturer’s warranty or if there had been a recall for this fault. If not, is it an expensive repair? Second question, my Mother-in-Law parked her car in Bradford at 7.30 when she and my wife went to the theatre. As the theatre car park was full they used a car park she had parked in before, which is a small private car park. On Saturday she received a letter saying a PCN was issued and should have been paid, saying she had to pay £70, which would double after 28 days. They said if she had paid within 14 days of the parking infringement it would have been £35 but now she must pay in full. There was no ticket on the car when they returned from the Theatre, otherwise she would have cursed and paid it within the 14 days. It was late in the evening not affecting the trade of any business. It has been issued by City of Bradford Metropolitan District Council. Before I write to them I should be really grateful if you could give some advice. By November, I need to buy a small, inexpensive car that is cheap to run. Its main role will be to get me to the station and back on my commute and for occasional short trips at weekends, so somewhere in the region of 6000 miles a year. A friend has an old VW Polo which he is happy to sell to me, although I am a little worried about the reliability of it. My budget is not much and, with a baby on the way, running costs need to be low. I had wanted to get an old Mazda convertible, but that is probably out of my reach. Generally, the best small older cheap car is a 1999-2005 Toyota Yaris 1.0 or 1.3 that sell from around £500 to around £2,000. You didn't give a budget so I hope that answers it.